Would you be willing to break the friend code? 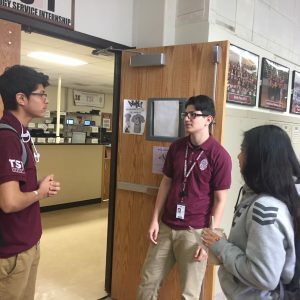 Seniors Robert Olvera and Anthony Figueroa argue about who gets Stephanie Ortega. Morton East students don’t want to break the friend code. In a random survey of 100 people, about 83 percent said that they would not date their friend’s crush. And the rest of the 17 percent said that they would date their friend’s crush instead of letting their friends have them. According to Dating Logic.net, you should first be honest with your best friend and tell them how you feel about their crush before dating them. Also, that people do this secretly in the hopes that somehow, they can keep this from their best friend but mostly fail. “I’ve worked with this kind of situation a lot of times with students. There are times where students say that they don’t care if they do that to their friends and others who were affected that get hurt by it. I’ve seen this more over at the Freshman Center,” psychologist Ms. Meyer said. We had gone to talk to the students from TSI and asked whether they have broken the friend code or if they have seen this happened to others. “I have broken the friend code many times and my friend found out a month later. But if my bro is happy, then we are cool. It was not the best choice and I would never want to break it again,” sophomore Robert Olvera said. In total my group had 6 quotes from others, and most of them contain a short story about someone else that they have seen or known that it had happened to them. “This friend never liked this girl and he was just plain mean to her. Then he broke up with her and one of his close friends had asked his ex out. Then the first guy that had broken up with her got angry because his friend had asked her out, “Business teacher Ms. Stephano said. There were a couple of students and faculty who were shocked to hear our survey question and there were others who had given our group crazy but also funny stories. “I wouldn’t steal my friend’s crush at all because that isn’t right at all. It’s like someone taking your cookie, “security Jennifer said. What would you say to a senior that said sharing is caring when it comes to dating their friend’s crush but also says that his friend is important to him? “If it’s my friend’s crush then she’s also my crush as well. I would tell them the truth about this. I would tell my best friend first because I know that our friendship would probably get affected in a bad way. The only official relationship is with my friend,” senior Gavin Salas said.